Martha Musonza, who founded the charity, came to the UK in 2001 having been a Geography and History teacher in Mutoko in the Mudzi District in Zimbabwe for seven years. She was also interested in adult education and had started a women’s co-operative, teaching women in villages to make arts, crafts and hand painted textiles. Martha met Samara Hawthorn, in Zimbabwe in 2000 and they became friends. Martha decided she wanted to visit the UK and resigned from her teaching position in December 2000. With Samara’s help, Martha left Zimbabwe and together they worked to set up a social enterprise to help disadvantaged Zimbabweans, especially those in rural areas. Martha met David Holman, now her husband, in April 2004 whilst studying in London and selling arts and crafts at markets. They were married in January 2007 and moved to Abergavenny in Wales. After several visits to Zimbabwe, seeing how the people were suffering, David joined Martha and Samara to create an organisation to highlight the positive aspects of Zimbabwe globally. 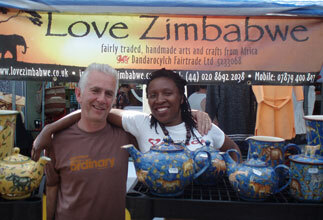 This is now registered as a Community Interest Company (CIC) called Love Zimbabwe Fairtrade CIC. They have been to Seattle twice to give talks, and to Oregon to sell their crafts at the Zimbabwean Music Festival. They have given talks and sold their arts and crafts at various festivals in the UK and Wales. Fair trade is helping small communities and enterprises in the developing world to beat poverty. This is a wonderful opportunity for Zimbabwe. The fair trade company has four directors, all of whom are based in the UK and have a strong passion for Zimbabwe and its people. Martha has worked with Fairtrade Wales for the past seven years. She does talks about fair trade, gender equality, climate change and poverty. She is currently volunteering for Oxfam’s schools Sparks programme. Martha feels strongly that diaspora Zimbabweans, black and white, should work together to improve conditions for the poor people in Zimbabwe. Love Zimbabwe Charity aims to reach a wider audience of people, including celebrities, who have an allegiance, affection or concern for Zimbabwe. We want to raise awareness of our work and create self-sustaining projects that will enable people to rebuild their lives. You can find out more about Dave and Martha’s incredible journey in David Holman’s book: From A-Z Abergavenny to Zimbabwe. These are his diaries 2008/9. The book is available to purchase on Amazon Kindle books at £4.54 and Dave will donate 50p to Love Zimbabwe Charity from every book sale. Thank you Dave!